You’re Washing Your Face Wrong. There I Said It!. 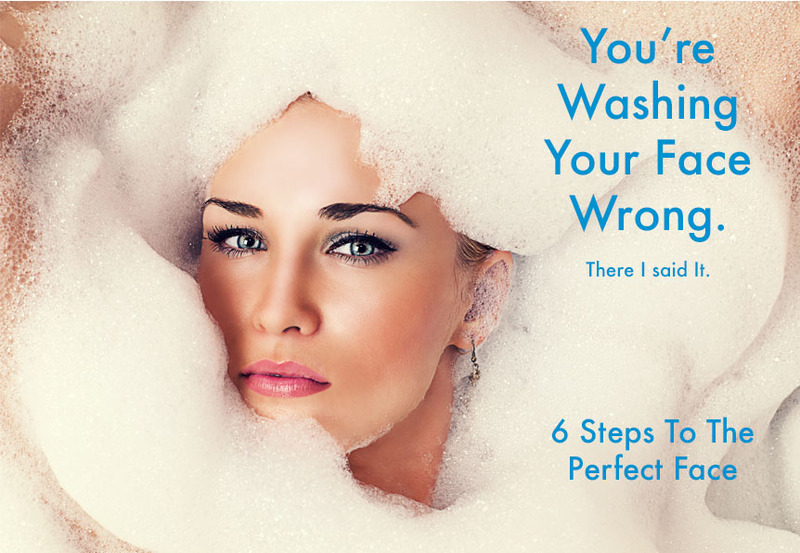 You’re Washing Your Face Wrong. There I Said IT! It’s hard to believe with the number of cleansing cloths and facial brushes on offer that we are still incorrectly washing our faces causing breakouts and early ageing! The fact that face washing tools have become so popular just shows how we’re struggling! There is no need for unnecessary (and potentially damaging)expensive tools just some good products. Let’s take a look at how to get the most out of your face routine now! It may sound obvious but putting dirty hands on your face is not good for it. Just wash your hands with soap and warm soapy water before touching your face. Simple. It’s obvious and known but people are still using them. Face wipes are drying out your skin causing breakouts, uneven texture and probably aren’t even removing all your makeup. It doesn’t matter if you follow with cleanser putting the face wipe to your skin does the damage first. If it is a good cleanser and you are using it correctly it will remove all your makeup. Oilacleanse – High concentrate of salicylic acid and vitamin E bursting balls work to clear pores, chemically exfoliate the skin and help calm and prevent blemishes and Acne. Number 5: Wash it all off. Again using a lukewarm water rinse your face of all products, take careful attention of around the nose and eyebrows as this may hide product. Leaving the cleanser on your skin will have a detrimental effect! As a rule when you think you have it all off just rinse it once more for luck! Insider Secret: use a clean microfibre cloth (The cheap ones used for cleansing) to help remove the product. Rinse in water then allow the cloth to grab the product. Use a clean one every evening. It’s worth throwing a pack of these in your weekly shop and start stocking up! Eventually, you’ll have a nice little stockpile. Using a dirty towel covered in bacteria will just ruin all the effort you just put in! Use a clean towel to dry. Now with your clean skin, your face is ready for your other tailored treatments and serums. Typically your whole face routine will take about 3 minutes or less! Now that’s pretty good for the clear and healthy skin! Book in now to get a full skin assessment and product recommendations.